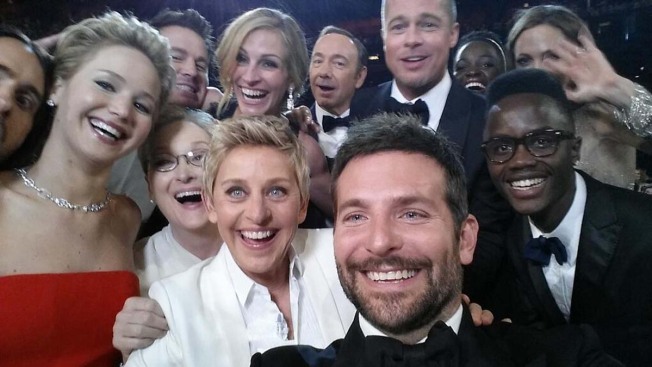 Ellen DeGeneres and Hollywood's hottest stars sitting in the audience at Sunday's Oscar event pose for a selfie. Ellen DeGeneres has attracted some of Hollywood's biggest stars on her daytime talk show, but who knew she could draw such a star-studded crowd with just her smartphone? The Oscar host whipped out her phone in the audience during Sunday's Academy Awards ceremony and solicited Liza Minnelli for a selfie. But what followed could arguably be the night's most epic social media moment: DeGeneres found herself flanked by some of Hollywood's hottest A-listers for the best selfie ever. Jared Leto, Jennifer Lawrence, Meryl Streep, Channing Tatum, Julia Roberts, Kevin Spacey, Brad Pitt, Lupita Nyong'o, Angelina Jolie and Bradley Cooper huddled up and smiled for DeGeneres' smartphone camera. The Internet went crazy and retweeted the photo over 1 million times less than a hour after DeGeneres posted it, breaking a previous retweet record held by a photo of President Barack Obama embracing his wife after the 2012 election.